"Yuca" redirects here. For the unrelated-New World plant, see Yucca. Manihot esculenta, commonly called cassava (/kəˈsɑːvə/), manioc, yuca, macaxeira, mandioca and aipim is a woody shrub native to South America of the spurge family, Euphorbiaceae. Although a perennial plant, cassava is extensively cultivated as an annual crop in tropical and subtropical regions for its edible starchy tuberous root, a major source of carbohydrates. Though it is often called yuca in Latin American Spanish and in the United States, it is not related to yucca, a shrub in the family Asparagaceae. Cassava is predominantly consumed in boiled form, but substantial quantities are used to extract cassava starch, called tapioca, which is used for food, animal feed and industrial purposes. 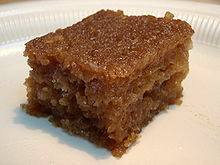 The Brazilian farinha, and the related garri of Western Africa, is an edible coarse flour obtained by grating cassava roots, pressing moisture off the obtained grated pulp, and finally drying it (and roasting in the case of farinha). Cassava is the third-largest source of food carbohydrates in the tropics, after rice and maize. Cassava is a major staple food in the developing world, providing a basic diet for over half a billion people. It is one of the most drought-tolerant crops, capable of growing on marginal soils. Nigeria is the world's largest producer of cassava, while Thailand is the largest exporter of cassava starch. Cassava is classified as either sweet or bitter. Like other roots and tubers, both bitter and sweet varieties of cassava contain antinutritional factors and toxins, with the bitter varieties containing much larger amounts. It must be properly prepared before consumption, as improper preparation of cassava can leave enough residual cyanide to cause acute cyanide intoxication, goiters, and even ataxia, partial paralysis, or death. The more toxic varieties of cassava are a fall-back resource (a "food security crop") in times of famine or food insecurity in some places. Farmers often prefer the bitter varieties because they deter pests, animals, and thieves. The cassava root is long and tapered, with a firm, homogeneous flesh encased in a detachable rind, about 1 mm thick, rough and brown on the outside. Commercial cultivars can be 5 to 10 cm (2.0 to 3.9 in) in diameter at the top, and around 15 to 30 cm (5.9 to 11.8 in) long. A woody vascular bundle runs along the root's axis. The flesh can be chalk-white or yellowish. Cassava roots are very rich in starch and contain small amounts of calcium (16 mg/100 g), phosphorus (27 mg/100 g), and vitamin C (20.6 mg/100 g). However, they are poor in protein and other nutrients. In contrast, cassava leaves are a good source of protein (rich in lysine), but deficient in the amino acid methionine and possibly tryptophan. Alcoholic beverages made from cassava include cauim and tiquira (Brazil), kasiri (Guyana, Suriname), impala (Mozambique), masato (Peruvian Amazonia chicha), parakari or kari (Guyana), nihamanchi (South America) also known as nijimanche (Ecuador and Peru), ö döi (chicha de yuca, Ngäbe-Bugle, Panama), sakurá (Brazil, Suriname), and tarul ko jaarh (Darjeeling, Sikkim, India). In many countries, significant research has begun to evaluate the use of cassava as an ethanol biofuel feedstock. Under the Development Plan for Renewable Energy in the Eleventh Five-Year Plan in the People's Republic of China, the target is to increase the production of ethanol fuel from nongrain feedstock to two million tonnes, and that of biodiesel to 200 thousand tonnes by 2010. This is equivalent to the replacement of 10 million tonnes of petroleum. As a result, cassava (tapioca) chips have gradually become a major source of ethanol production. On 22 December 2007, the largest cassava ethanol fuel production facility was completed in Beihai, with annual output of 200 thousand tons, which would need an average of 1.5 million tons of cassava. In November 2008, China-based Hainan Yedao Group invested US$51.5 million in a new biofuel facility that is expected to produce 33 million US gallons (120,000 m3) a year of bioethanol from cassava plants. According to the American Cancer Society, cassava is ineffective as an anti-cancer agent: "there is no convincing scientific evidence that cassava or tapioca is effective in preventing or treating cancer". Cassava roots, peels and leaves should not be consumed raw because they contain two cyanogenic glucosides, linamarin and lotaustralin. These are decomposed by linamarase, a naturally occurring enzyme in cassava, liberating hydrogen cyanide (HCN). Cassava varieties are often categorized as either sweet or bitter, signifying the absence or presence of toxic levels of cyanogenic glucosides, respectively. The so-called sweet (actually not bitter) cultivars can produce as little as 20 milligrams of cyanide (CN) per kilogram of fresh roots, whereas bitter ones may produce more than 50 times as much (1 g/kg). Cassavas grown during drought are especially high in these toxins. A dose of 25 mg of pure cassava cyanogenic glucoside, which contains 2.5 mg of cyanide, is sufficient to kill a rat. Excess cyanide residue from improper preparation is known to cause acute cyanide intoxication, and goiters, and has been linked to ataxia (a neurological disorder affecting the ability to walk, also known as konzo). It has also been linked to tropical calcific pancreatitis in humans, leading to chronic pancreatitis. Symptoms of acute cyanide intoxication appear four or more hours after ingesting raw or poorly processed cassava: vertigo, vomiting, and collapse. In some cases, death may result within one or two hours. It can be treated easily with an injection of thiosulfate (which makes sulfur available for the patient's body to detoxify by converting the poisonous cyanide into thiocyanate). "Chronic, low-level cyanide exposure is associated with the development of goiter and with tropical ataxic neuropathy, a nerve-damaging disorder that renders a person unsteady and uncoordinated. Severe cyanide poisoning, particularly during famines, is associated with outbreaks of a debilitating, irreversible paralytic disorder called konzo and, in some cases, death. The incidence of konzo and tropical ataxic neuropathy can be as high as three percent in some areas." During the shortages in Venezuela in the late-2010s, dozens of deaths were reported due to Venezuelans resorting to eating bitter cassava in order to curb starvation. 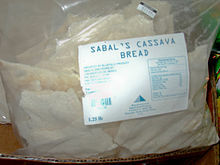 Societies that traditionally eat cassava generally understand that some processing (soaking, cooking, fermentation, etc.) is necessary to avoid getting sick. 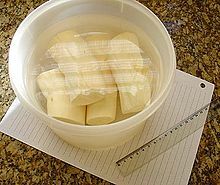 Brief soaking (four hours) of cassava is not sufficient, but soaking for 18–24 hours can remove up to half the level of cyanide. Drying may not be sufficient, either. For some smaller-rooted, sweet varieties, cooking is sufficient to eliminate all toxicity. The cyanide is carried away in the processing water and the amounts produced in domestic consumption are too small to have environmental impact. The larger-rooted, bitter varieties used for production of flour or starch must be processed to remove the cyanogenic glucosides. The large roots are peeled and then ground into flour, which is then soaked in water, squeezed dry several times, and toasted. The starch grains that flow with the water during the soaking process are also used in cooking. The flour is used throughout South America and the Caribbean. Industrial production of cassava flour, even at the cottage level, may generate enough cyanide and cyanogenic glycosides in the effluents to have a severe environmental impact. A safe processing method known as the "wetting method" is to mix the cassava flour with water into a thick paste and then let it stand in the shade for five hours in a thin layer spread over a basket. In that time, about 83% of the cyanogenic glycosides are broken down by the linamarase; the resulting hydrogen cyanide escapes to the atmosphere, making the flour safe for consumption the same evening. The traditional method used in West Africa is to peel the roots and put them into water for three days to ferment. The roots then are dried or cooked. In Nigeria and several other west African countries, including Ghana, Cameroon, Benin, Togo, Ivory Coast, and Burkina Faso, they are usually grated and lightly fried in palm oil to preserve them. The result is a foodstuff called gari. Fermentation is also used in other places such as Indonesia (see Tapai). The fermentation process also reduces the level of antinutrients, making the cassava a more nutritious food. The reliance on cassava as a food source and the resulting exposure to the goitrogenic effects of thiocyanate has been responsible for the endemic goiters seen in the Akoko area of southwestern Nigeria. A project called "BioCassava Plus" uses bioengineering to grow cassava with lower cyanogenic glycosides combined with fortification of vitamin A, iron and protein to improve the nutrition of people in sub-Saharan Africa. Cassava is harvested by hand by raising the lower part of the stem and pulling the roots out of the ground, then removing them from the base of the plant. The upper parts of the stems with the leaves are plucked off before harvest. Cassava is propagated by cutting the stem into sections of approximately 15 cm, these being planted prior to the wet season. Cassava undergoes post-harvest physiological deterioration (PPD) once the tubers are separated from the main plant. The tubers, when damaged, normally respond with a healing mechanism. However, the same mechanism, which involves coumaric acids, starts about 15 minutes after damage, and fails to switch off in harvested tubers. It continues until the entire tuber is oxidized and blackened within two to three days after harvest, rendering it unpalatable and useless. PPD is related to the accumulation of reactive oxygen species (ROS) initiated by cyanide release during mechanical harvesting. Cassava shelf life may be increased up to three weeks by overexpressing a cyanide insensitive alternative oxidase, which suppressed ROS by 10-fold. PPD is one of the main obstacles preventing farmers from exporting cassavas abroad and generating income. Fresh cassava can be preserved like potato, using thiabendazole or bleach as a fungicide, then wrapping in plastic, coating in wax or freezing. While alternative methods for PPD control have been proposed, such as preventing ROS effects by use of plastic bags during storage and transport or coating the roots with wax, and freezing roots, such strategies have proved to be economically or technically impractical, leading to breeding of cassava varieties more tolerant to PPD and with improved durability after harvest. Plant breeding has resulted in different strategies for cassava tolerance to PPD. One was induced by mutagenic levels of gamma rays, which putatively silenced one of the genes involved in PPD genesis, while another was a group of high-carotene clones in which the antioxidant properties of carotenoids are postulated to protect the roots from PPD. A major cause of losses during cassava storage is infestation by insects. A wide range of species that feed directly on dried cassava chips have been reported as a major factor in spoiling stored cassava, with losses between 19% and 30% of the harvested produce. In Africa, a previous issue was the cassava mealybug (Phenacoccus manihoti) and cassava green mite (Mononychellus tanajoa). These pests can cause up to 80 percent crop loss, which is extremely detrimental to the production of subsistence farmers. These pests were rampant in the 1970s and 1980s but were brought under control following the establishment of the "Biological Control Centre for Africa" of the International Institute of Tropical Agriculture (IITA) under the leadership of Hans Rudolf Herren. The Centre investigated biological control for cassava pests; two South American natural enemies Apoanagyrus lopezi (a parasitoid wasp) and Typhlodromalus aripo (a predatory mite) were found to effectively control the cassava mealybug and the cassava green mite, respectively. The African cassava mosaic virus causes the leaves of the cassava plant to wither, limiting the growth of the root. An outbreak of the virus in Africa in the 1920s led to a major famine. The virus is spread by the whitefly and by the transplanting of diseased plants into new fields. Sometime in the late-1980s, a mutation occurred in Uganda that made the virus even more harmful, causing the complete loss of leaves. This mutated virus spread at a rate of 50 mi (80 km) per year, and as of 2005 was found throughout Uganda, Rwanda, Burundi, the Democratic Republic of the Congo and the Republic of the Congo. Cassava brown streak virus disease has been identified as a major threat to cultivation worldwide. A wide range of plant parasitic nematodes have been reported associated with cassava worldwide. These include Pratylenchus brachyurus, Rotylenchulus reniformis, Helicotylenchus spp., Scutellonema spp. and Meloidogyne spp., of which Meloidogyne incognita and Meloidogyne javanica are the most widely reported and economically important. Meloidogyne spp. feeding produces physically damaging galls with eggs inside them. Galls later merge as the females grow and enlarge, and they interfere with water and nutrient supply. Cassava roots become tough with age and restrict the movement of the juveniles and the egg release. It is therefore possible that extensive galling can be observed even at low densities following infection. Other pest and diseases can gain entry through the physical damage caused by gall formation, leading to rots. They have not been shown to cause direct damage to the enlarged storage roots, but plants can have reduced height if there was loss of enlarged root weight. Research on nematode pests of cassava is still in the early stages; results on the response of cassava is, therefore, not consistent, ranging from negligible to seriously damaging. Since nematodes have such a seemingly erratic distribution in cassava agricultural fields, it is not easy to clearly define the level of direct damage attributed to nematodes and thereafter quantify the success of a chosen management method. The use of nematicides has been found to result in lower numbers of galls per feeder root compared to a control, coupled with a lower number of rots in the storage roots. The organophosphorus nematicide femaniphos, when used, did not affect crop growth and yield parameter variables measured at harvest. Nematicide use in cassava is neither practical nor sustainable; the use of tolerant and resistant cultivars is the most practical and sustainable management method. ^ a b "Manihot esculenta". World Checklist of Selected Plant Families (WCSP). Royal Botanic Gardens, Kew. Retrieved 21 March 2017. ^ "Manihot esculenta". Germplasm Resources Information Network (GRIN). Agricultural Research Service (ARS), United States Department of Agriculture (USDA). Retrieved 4 January 2014. ^ "Cassava". Food and Agriculture Organization of the United Nations. ^ Fauquet Claude; Fargette Denis (1990). "African Cassava Mosaic Virus: Etiology, Epidemiology, and Control" (PDF). Plant Disease. 74 (6): 404–11. doi:10.1094/pd-74-0404. ^ a b c d e "Ch. 7 Toxic substances and antinutritional factors". Roots, tubers, plantains and bananas in human nutrition. Rome: Food and Agriculture Organization of the United Nations. 1990. ISBN 9789251028629. ^ a b "CASSAVA POISONING – VENEZUELA". ProMED-mail. 29 January 2017. Retrieved 29 January 2017. ^ "Cassava poisoning was integral to Episode 177 of Series 17 of the BBC drama 'Doctors'". BBC. 5 February 2016. ^ Chiwona-Karltun, Linley; Katundu, Chrissie; Ngoma, James; Chipungu, Felistus; Mkumbira, Jonathan; Simukoko, Sidney; Jiggins, Janice (2002). "Bitter cassava and women: an intriguing response to food security". LEISA Magazine. 18 (4). ^ "Basic Report: 11134, Cassava, raw". National Nutrient Database for Standard Reference Release 28. Agricultural Research Service, US Department of Agriculture. May 2016. Retrieved 7 December 2016. ^ Ravindran, Velmerugu (1992). "Preparation of cassava leaf products and their use as animal feeds" (PDF). FAO Animal Production and Health Paper (95): 111–125. Retrieved 13 August 2010. ^ Pope, Kevin O.; Pohl, Mary E. D.; Jones, John G.; Lentz, David L.; von Nagy, Christopher; Vega, Francisco J.; Quitmyer, Irvy R. (2001). "Origin and Environmental Setting of Ancient Agriculture in the Lowlands of Mesoamerica". Science. 292 (5520): 1370–3. Bibcode:2001Sci...292.1370P. doi:10.1126/science.292.5520.1370. PMID 11359011. ^ Earle, Rebecca (2012) The Body of the Conquistador: Food, Race, and the Colonial Experience in Spanish America, 1492–1700. New York: Cambridge University Press. pp. 54–57, 151. ISBN 978-1107693296. ^ Long, Janet (2003). Conquest and food: consequences of the encounter of two worlds; page 75. UNAM. ISBN 978-9703208524. ^ Watkins, Thayer (2006). "The Economic History of Havana, Cuba: A City So Beautiful and Important It Was Once Worth More Than All of Florida". San José State University, Department of Economics. ^ Super, John C. (1984). "Spanish Diet in the Atlantic Crossing". Terra Incognita. 16: 60–63. ^ Nweke, Felix I. (2005). "The cassava transformation in Africa". A review of cassava in Africa with country case studies on Nigeria, Ghana, the United Republic of Tanzania, Uganda and Benin. Proceedings of the Validation Forum on the Global Cassava Development Strategy. Vol. 2. Rome: The Food and Agriculture Organization of the United Nations. ^ Hershey, Clair; et al. (April 2000). "Cassava in Asia. Expanding the Competitive Edge in Diversified Markets". A review of cassava in Asia with country case studies on Thailand and Viet Nam. Rome: Food and Agriculture Organization of the United Nations. ^ Adams, C.; Murrieta, R.; Siqueira, A.; Neves, W.; Sanches, R. (2009). "Bread of the Land: the Invisibility of Manioc in the Amazon". Amazon Peasant Societies in a Changing Environment. pp. 281–305. doi:10.1007/978-1-4020-9283-1_13. ISBN 978-1-4020-9282-4. ^ a b "Cassava production in 2016, Crops/World Regions/Production Quantity from pick lists". UN Food and Agriculture Organization Corporate Statistical Database (FAOSTAT). 2017. Retrieved 24 March 2018. ^ Stone, G. D. (2002). "Both Sides Now". Current Anthropology. 43 (4): 611–630. doi:10.1086/341532. ^ Save and Grow: Cassava (PDF). Rome: Food and Agriculture Organization. 2013. p. iii. ISBN 978-92-5-107641-5. Retrieved 27 October 2016. ^ Frederick Douglass Opie, Hog and Hominy: Soul Food from Africa to America, (Columbia University Press 2008), chapters 1–2. ^ a b Tewe, Olumide O. (2004). "The Global Cassava Development Strategy". U.N. Food and Agriculture Organization. ^ "Stuart's Brasil" (Blog). 30 January 2009. Retrieved 29 May 2015. ^ "Cassava bio-ethanol plant to open in China". businessGreen. 5 November 2008. Retrieved 29 May 2015. ^ R. Lunsin; M. Wanapat; P. Rowlinson (October 2012). "Effect of cassava hay and rice bran oil supplementation on rumen fermentation, milk yield and milk composition in lactating dairy cows". Asian-Australasian Journal of Animal Sciences (AAJS). 25 (10): 1364–1373. doi:10.5713/ajas.2012.12051. PMC 4093022. PMID 25049491. ^ "Cassava". American Cancer Society. November 2008. Retrieved 22 September 2013. ^ a b c Cereda, M. P.; Mattos, M. C. Y. (1996). "Linamarin: the Toxic Compound of Cassava". Journal of Venomous Animals and Toxins. 2: 06–12. doi:10.1590/S0104-79301996000100002. ^ Aregheore E. M.; Agunbiade O. O. (1991). "The toxic effects of cassava (Manihot esculenta Crantz) diets on humans: a review". Vet. Hum. Toxicol. 33 (3): 274–275. PMID 1650055. ^ White W. L. B.; Arias-Garzon D. I.; McMahon J. M.; Sayre R. T. (1998). "Cyanogenesis in Cassava, The Role of Hydroxynitrile Lyase in Root Cyanide Production". Plant Physiol. 116 (4): 1219–1225. doi:10.1104/pp.116.4.1219. PMC 35028. PMID 9536038. ^ Bhatia E (2002). "Tropical calcific pancreatitis: strong association with SPINK1 trypsin inhibitor mutations". Gastroenterology. 123 (4): 1020–1025. doi:10.1053/gast.2002.36028. PMID 12360463. ^ Wagner, Holly. "Cassava's cyanide-producing abilities can cause neuropathy". cidpusa.org. Retrieved 21 June 2010. ^ Siritunga D; Sayre RT (September – October 2007). "Transgenic approaches for cyanogen reduction in cassava". J AOAC Int. 90 (5): 1450–5. PMID 17955993. ^ Padmaja, G.; Steinkraus, K. H. (1995). "Cyanide detoxification in cassava for food and feed uses". Critical Reviews in Food Science and Nutrition. 35 (4): 299–339. doi:10.1080/10408399509527703. PMID 7576161. ^ a b Bradbury, J.H. (2006). "Simple wetting method to reduce cyanogen content of cassava flour" (PDF). J Food Composition Analysis. 19 (4): 388–393. doi:10.1016/j.jfca.2005.04.012. ^ Oboh G, Oladunmoye MK (2007). "Biochemical changes in micro-fungi fermented cassava flour produced from low- and medium-cyanide variety of cassava tubers". Nutr Health. 18 (4): 355–67. doi:10.1177/026010600701800405. PMID 18087867. ^ Akindahunsi AA, Grissom FE, Adewusi SR, Afolabi OA, Torimiro SE, Oke OL (1998). "Parameters of thyroid function in the endemic goitre of Akungba and Oke-Agbe villages of Akoko area of southwestern Nigeria". African Journal of Medicine and Medical Sciences. 27 (3–4): 239–42. PMID 10497657. ^ Bumoko GM, Sadiki NH, Rwatambuga A, Kayembe KP, Okitundu DL, Mumba Ngoyi D, Muyembe JJ, Banea JP, Boivin MJ, Tshala-Katumbay D (15 February 2015). "Lower serum levels of selenium, copper, and zinc are related to neuromotor impairments in children with konzo". J Neurol Sci. 349 (1–2): 149–53. doi:10.1016/j.jns.2015.01.007. PMC 4323625. PMID 25592410. ^ Sayre, R.; Beeching, J. R.; Cahoon, E. B.; Egesi, C.; Fauquet, C.; Fellman, J.; Fregene, M.; Gruissem, W.; Mallowa, S.; Manary, M.; Maziya-Dixon, B.; Mbanaso, A.; Schachtman, D. P.; Siritunga, D.; Taylor, N.; Vanderschuren, H.; Zhang, P. (2011). "The BioCassava Plus Program: Biofortification of Cassava for Sub-Saharan Africa". Annual Review of Plant Biology. 62: 251–272. doi:10.1146/annurev-arplant-042110-103751. PMID 21526968. ^ "BioCassava Plus". St. Louis, Missouri, USA: Donald Danforth Plant Science Center. 2018. Retrieved 23 March 2018. ^ Howeler, Reinhardt H. (2007). "Production techniques for sustainable cassava production in Asia" (PDF). Centro Internacional de Agricultura Tropical (CIAT), Bangkok. ^ Zidenga, T; et al. (2012). "Extending cassava root shelf life via reduction of reactive oxygen species production". Plant Physiology. 159 (4): 1396–1407. doi:10.1104/pp.112.200345. PMC 3425186. PMID 22711743. ^ "Storage and processing of roots and tubers in the tropics". U.N. Food and Agriculture Organization. Retrieved 4 May 2016. ^ a b Morante, N.; Sánchez, T.; Ceballos, H.; Calle, F.; Pérez, J. C.; Egesi, C.; Cuambe, C. E.; Escobar, A. F.; Ortiz, D.; Chávez, A. L.; Fregene, M. (2010). "Tolerance to Postharvest Physiological Deterioration in Cassava Roots". Crop Science. 50 (4): 1333–1338. doi:10.2135/cropsci2009.11.0666. ^ a b Osipitan, A. A; Sangowusi, V. T; Lawal, O. I; Popoola, K. O (2015). "Correlation of Chemical Compositions of Cassava Varieties to Their Resistance to Prostephanus truncatus Horn (Coleoptera: Bostrichidae)". Journal of Insect Science. 15 (1): 13. doi:10.1093/jisesa/ieu173. PMC 4535132. PMID 25700536. ^ "1995: Herren". The World Food Prize Foundation. Retrieved 29 May 2015. ^ "Cassava (manioc)". Archived from the original on 30 June 2015. Retrieved 29 May 2015. ^ a b "Virus ravages cassava plants in Africa". The New York Times. 31 May 2010. ^ "Hungry African nations balk at biotech cassava". St. Louis Post-Dispatch. 31 August 2005. Archived from the original on 3 March 2012. Retrieved 11 August 2008. ^ Mc Sorley, R.; Ohair, S. K.; Parrado, J.L. (1983). "Nematodes of Cassava, Manihot esculenta Crantz". Nematropica. 13: 261–287. ^ a b Gapasin, R.M. (1980). "Reaction of golden yellow cassava to Meloidogyne spp. Inoculation". Annals of Tropical Research. 2: 49–53. ^ a b c Coyne, D. L. (1994). "Nematode pests of cassava". African Crop Science Journal. 2 (4): 355–359. ^ Caveness, F.E. (1982). "Root-knot nematodes as parasites of cassava". IITA Research Briefs. 3 (2): 2–3. ^ Coyne, D.L. ; Talwana, L.A.H. (2000). "Reaction of cassava cultivars to root-knot nematode (Meloidogyne spp.) in pot experiments and farmer-managed field trials in Uganda". International Journal of Nematology. 10: 153–158. ^ Makumbi-Kidza, N. N.; Speijer; Sikora R. A. (2000). "Effects of Meloidogyne incognita on growth and storage-root formation of cassava (Manihot esculenta)". Journal of Nematology. 32 (4S): 475–477. PMC 2620481. PMID 19270997. ^ Theberge, R. L., ed. (1985). Common African pests and diseases of cassava, yam, sweet potato and cocoyam. Ibadan, Nigeria: International Institute of Tropical Agriculture (IITA). p. 107. ISBN 9789781310010. ^ Coyne DL; Kagoda F; Wambugu E; Ragama P (2006). "Response of cassava to nematicide application and plant-parasitic nematode infection in East Africa, with emphasis on root-knot nematode". International Journal of Pest Management. 52 (3): 215–23. doi:10.1080/09670870600722959. Wikimedia Commons has media related to Manihot esculenta. 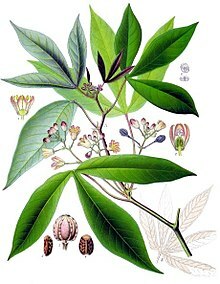 Look up cassava in Wiktionary, the free dictionary. This page was last edited on 24 April 2019, at 13:42 (UTC).